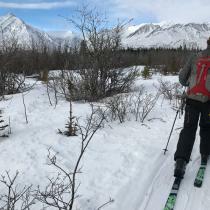 From Haines Junction, continue north on the Alaska Highway for a total of 13.4 km. There is now a pullout and parking area for the trailhead. 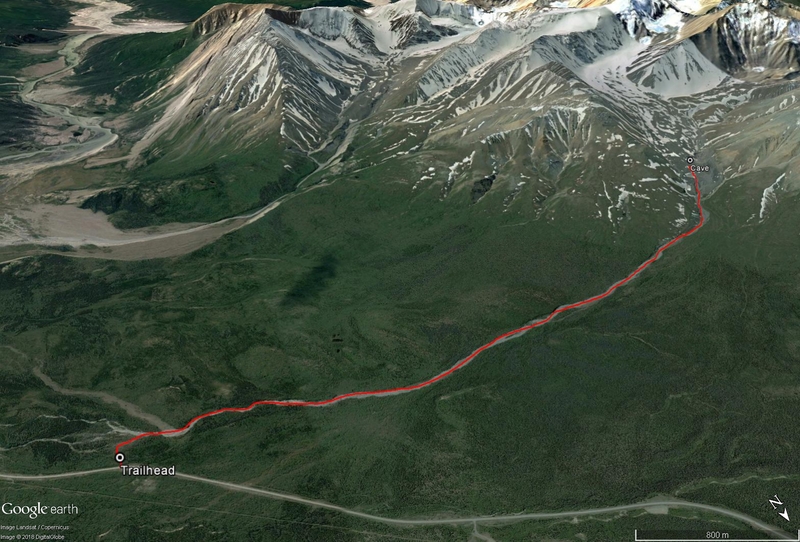 As another landmark, the trailhead is about 3.4 km passed the turnoff for the Alsek Trail. Watch for the trailhead on the left (south) side of the highway marked with flagging. 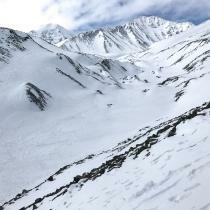 Only the winter route has been recorded for this hike. 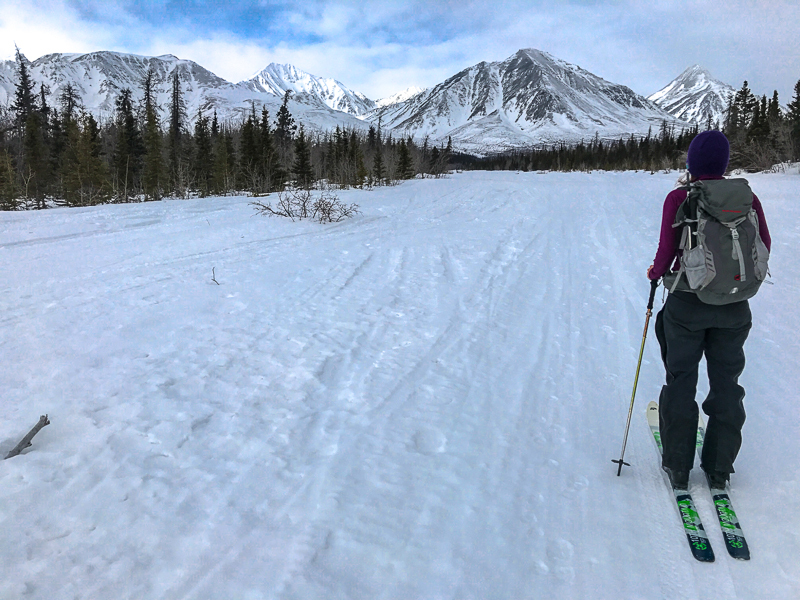 During this time of year, the frozen creek bed provides an easy hike option in mid-winter and early spring before the ice breaks up. 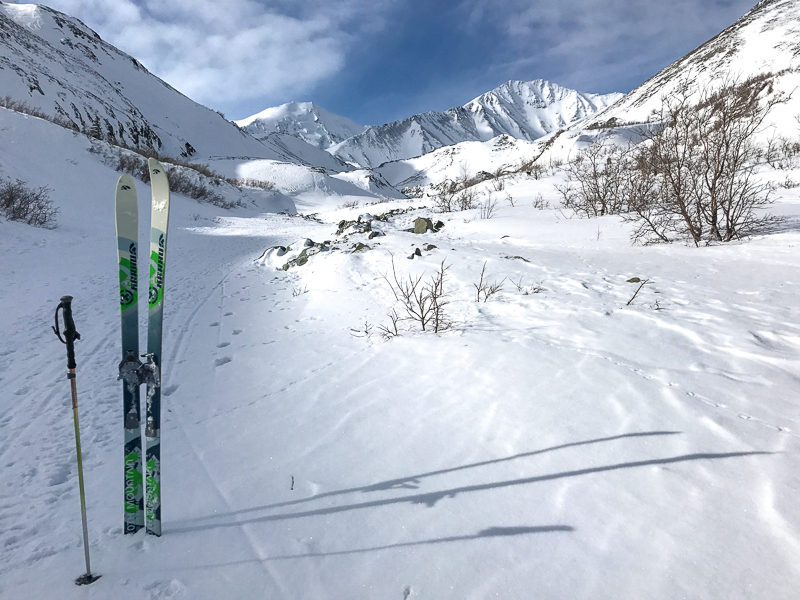 This hike is suitable for snowshoeing and ski touring (Nordic touring skis or even cross country skis are great). 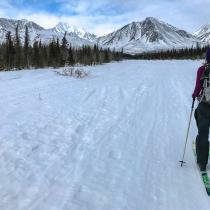 Depending on conditions you may not even need snowshoes, so keep in mind recent snowfall and whether you'll be hiking in warmer spring-like weather when post holing could be a problem. From the trailhead follow a well-used trail heading through the trees to the south. The trail winds through stunted trees to reach a creek bed within the first 300 m. Follow the creek bed upstream (right), where the elevation gain is very gradual the whole way to the cave. 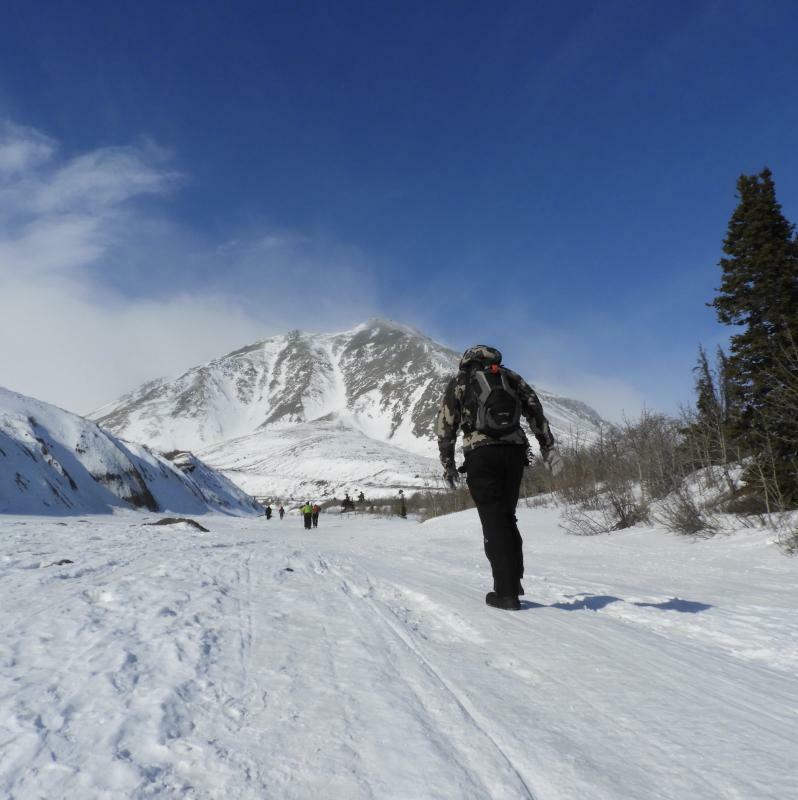 You may encounter overflow ice and bare ice along the way, which can easily be avoided by sticking to the snowier patches. 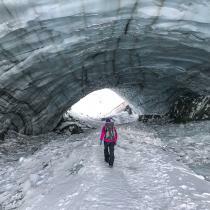 As you approach the cave you can see the moraines left by the retreating glacier and then the opening of the ice cave. 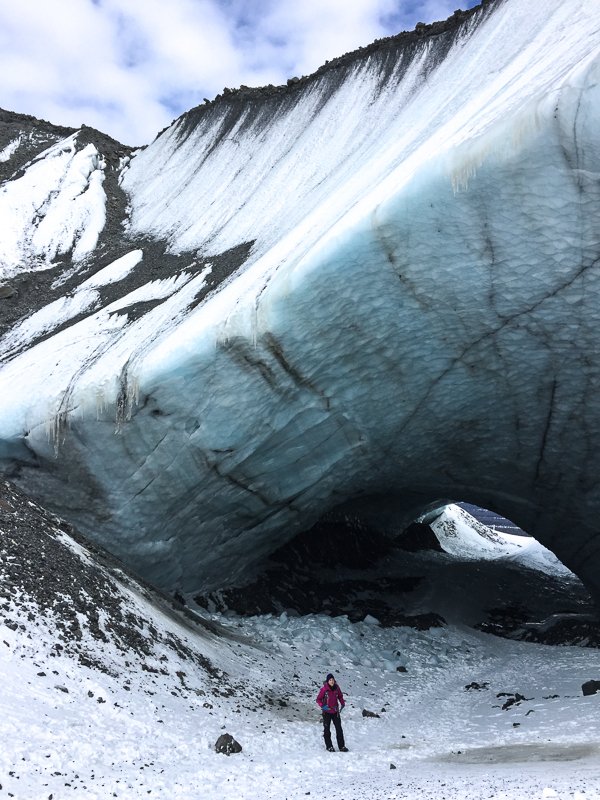 With good weather you can catch a glimpse of northeast face of Mount Archibald with its hanging glacier. 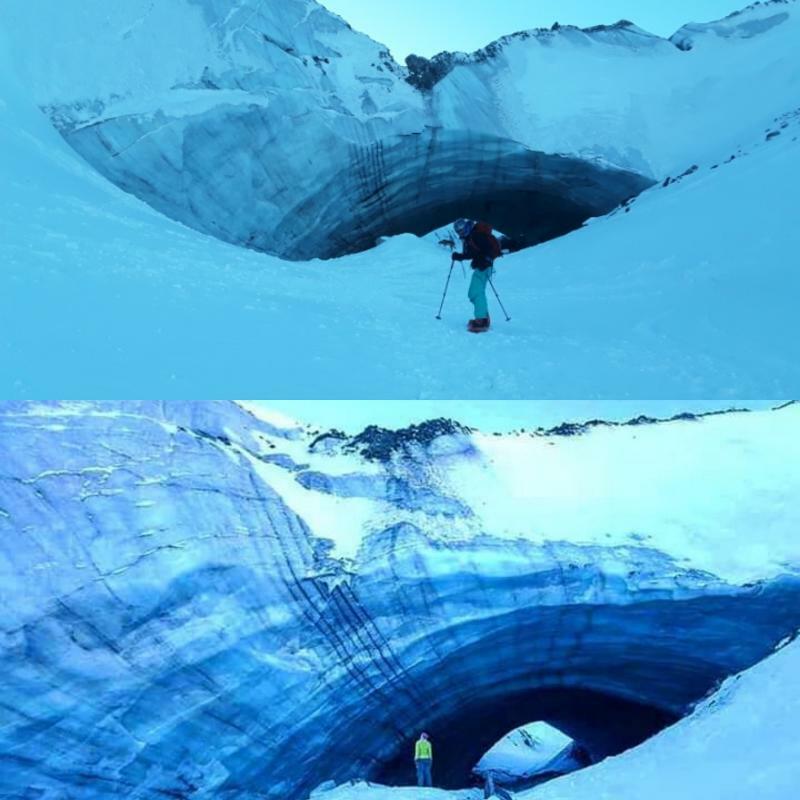 The ice cave/tunnel itself is deceivingly deeper and larger than it looks from the outside. If you choose to explore the cave, use extra caution. 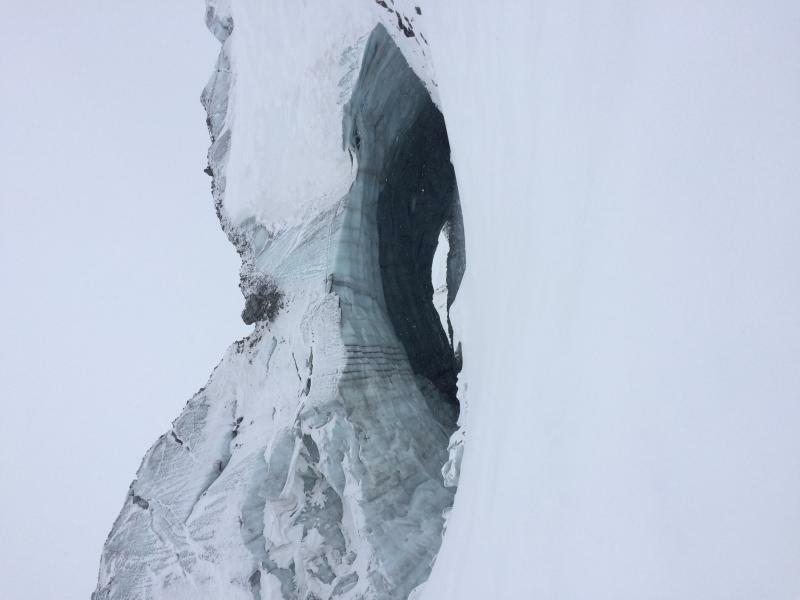 While the ice arch is many meters thick at its narrowest, there's still plenty of evidence of ice blocks and rocks falling from the ceiling of the cave. Be particularly careful during warmer weather and extreme temperature swings. 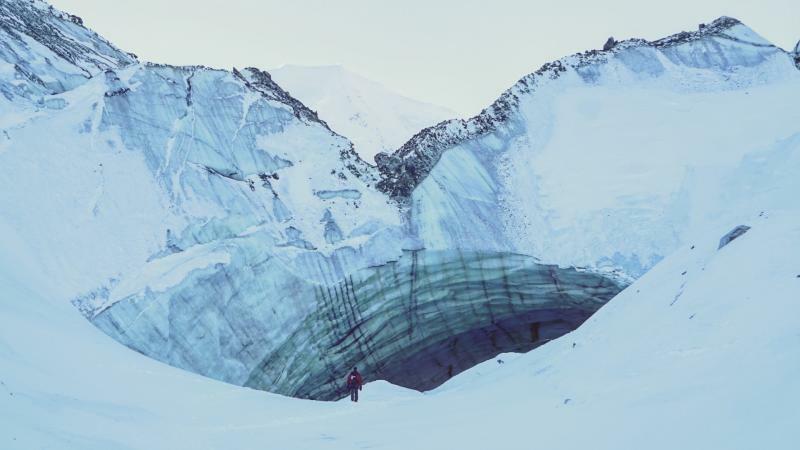 Know the risk that ice could fall or the cave could collapse at any time. Many recommend not going inside the cave at all. Return the way you came. 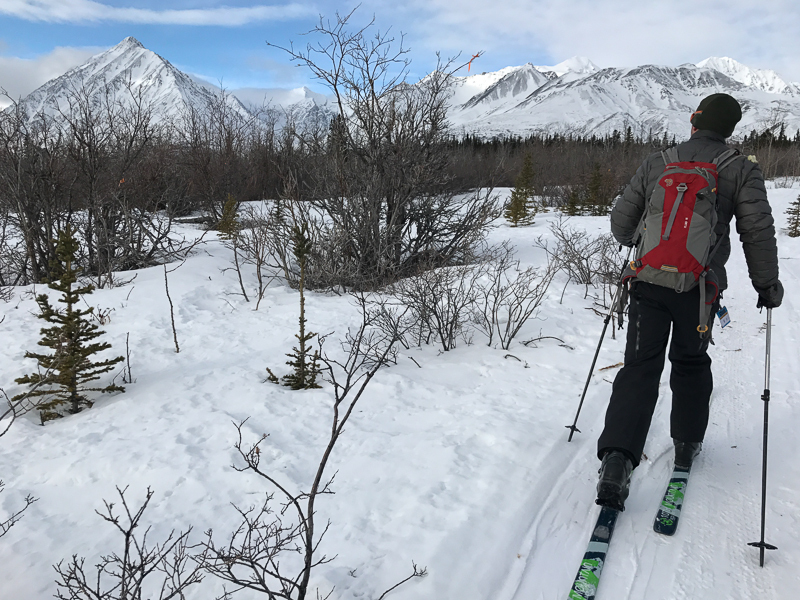 If you are looking for a longer hike there are ridges to explore to the south and north, especially in the spring when the snow has started to melt and there's bare ground to hike on. 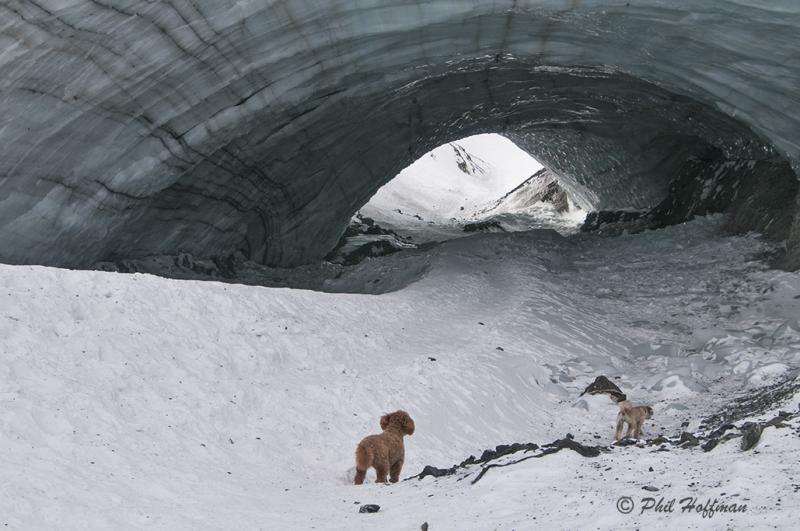 Have you been to Kluane Ice Cave lately? We tried going up to the cave (Mar 24) and found the trail along the creek too soft. We were postholing and my husband had soakers before we hit 1km. We decided to abandon the mission. If you go, know the trail is highly degraded now. 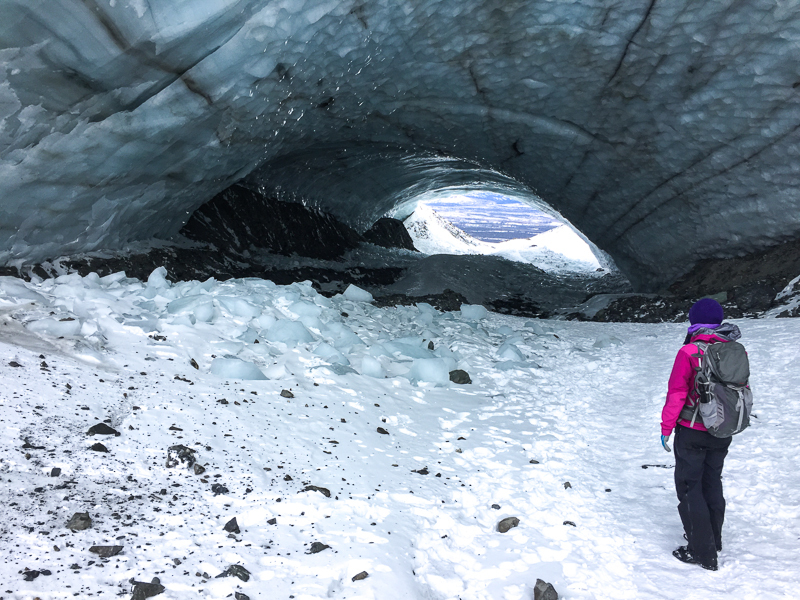 A group of 7 of us hiked to the ice cave on February 28. 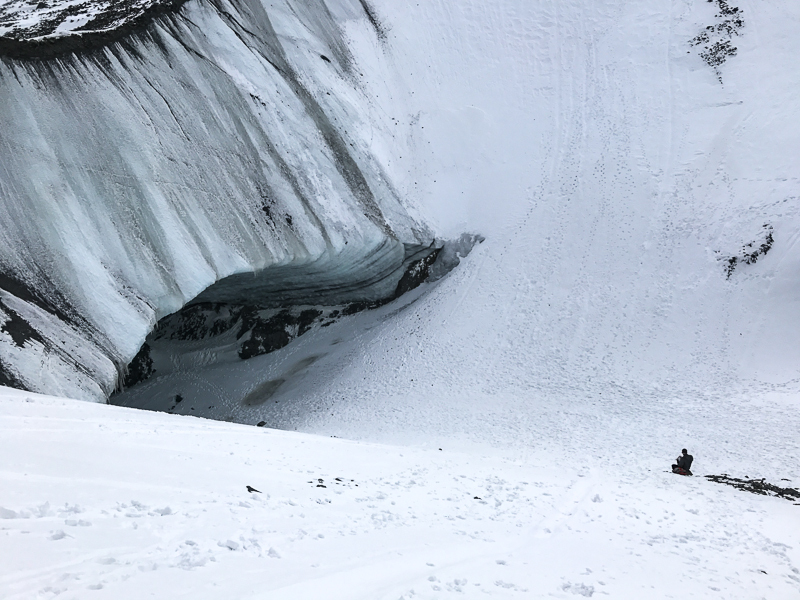 CBC reporter Philippe Morin had asked to join us, and as he was filming a monologue right in front of the cave, a huge section of the ceiling collapsed. There was no warning, and it would certainly have killed anyone in there. The video will no doubt be going viral shortly. There are other dangers, too - a huge rock is about to fall and it could bounce a considerable distance. We had 2 dogs fall through the snow/ice crust over the creek to the point of needing assistance to get out, and one of the hikers broke through and got wet feet. It's an awesome hike, but be warned. We were at the cave February 23. A small group of people were standing outside the cave a few metres in front of it. A large portion of the front wall collapsed. One person only missed being hit by leaping out of the way and several had a very close call. 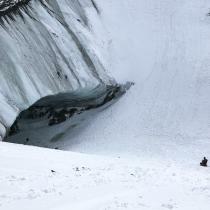 There is also a steep slope with a good layer of snow to the left of the cave. The falling ice shook the ground. 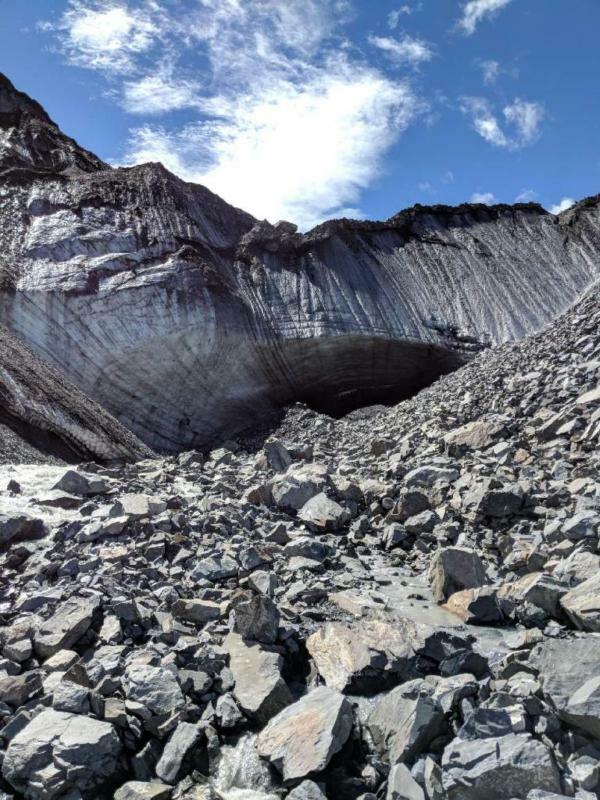 It seems like another collapse could trigger an avalanche there. We had a great day. Beautiful ski and the cave is stunning. Watch out though! Don't go too close! Did this hike yesterday. Well packed trail, cold temps made it not so icy. 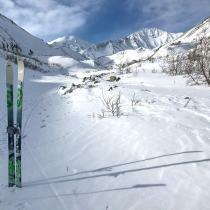 We ski toured up and skied down. 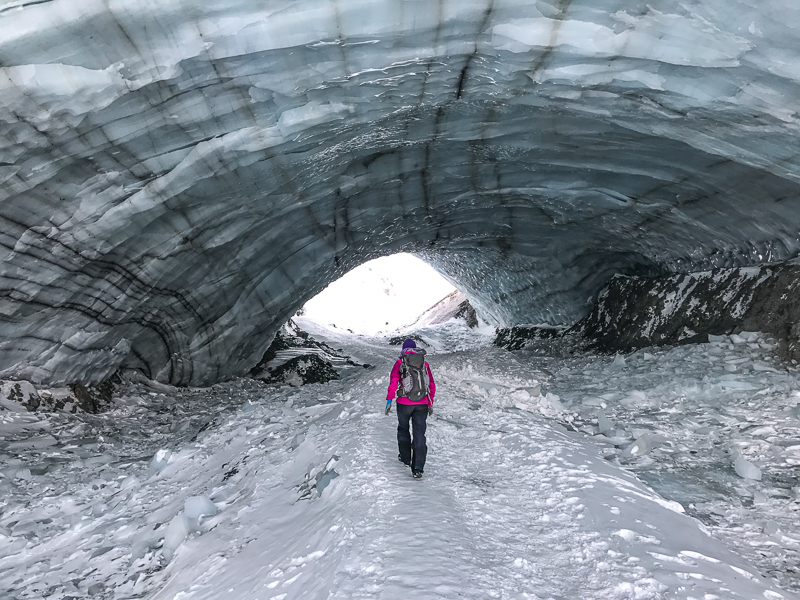 The cave is much smaller compared to last year, same time (jan 2018). So definitely go check it out, I predict it will either topple this spring o rnext year. Don't go inside. it's super sketchy, saw some people in there, that structure doesn't look stable especially compared to last year. 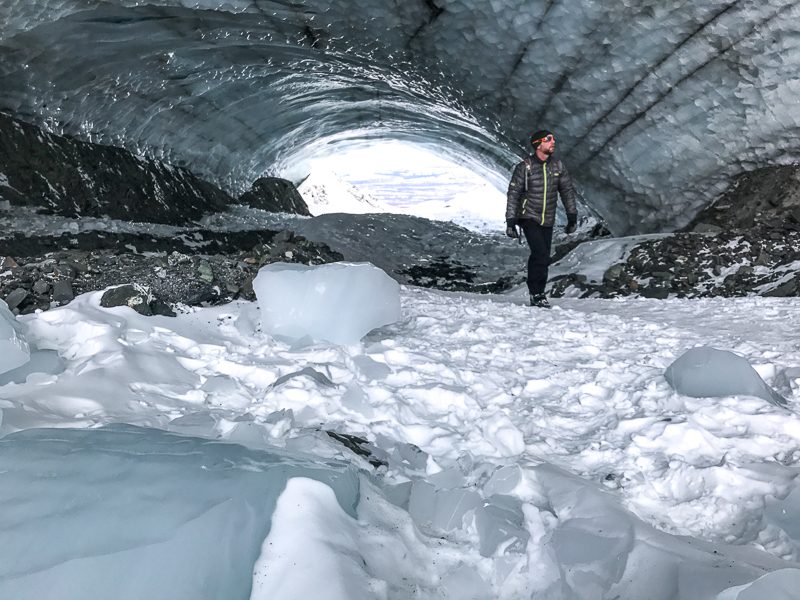 My husband and I hiked to the ice cave on Jan 13th. The trail was excellent, we brought snowshoes but didn't end up needing them. The trail is well packed all the way to the cave. Currently no need for spikes either. There and back took us 4 hours right on, with a 30 minute stop at the cave for photos and a snack. The pullout has been made larger by highways, they've brushed and cleared snow from a large area at the trailhead for parking. We began hiking at 9:40am and were the first ones on the trail, saw a couple groups of people on our way back. We clocked the distance with our fitness trackers and got 6.8kms from the parking area to the cave (for a total of 13.6km following the current trail). 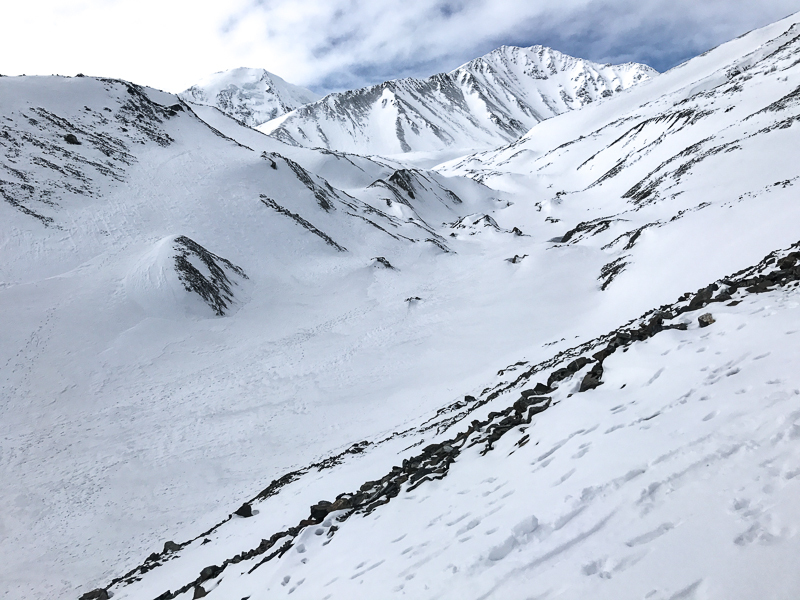 Did this trail Dec 23. I’m not sure why it says the trail head is 13.4km. We measured it with the odometer and it is just over 14km from the turn off. Also, the description should be updated as there is now a pullout for vehicles to park. It has recently been graded and plowed. Hiked this trail on July 2nd. 5 hr hike (3 hrs in as it took longer to pick out the best way up the creek). If you stay on the right side of the creek bed (definitely wide enough) you only have to cross the creek 3 times so be prepared for wet feet or take crocks, sandals not recommended as you need something sturdy on your feet as the creek is fast moving and sometimes as deep as your knees, hiking poles is another great option. Recommend you stay to the right side of the creek as much as possible. The creek bed is rocky with unstable rocks at times, you have to make sure where you are putting your feet. We had an amazing day, sunshine and breathtaking views. The entrance to the cave is piled high with rocks/sand that is coming down from the top, recommend you do not get close as large boulders were coming down as well, having said that we were close enough to get a great view and take amazing pictures. We did not enter the cave, too unstable! 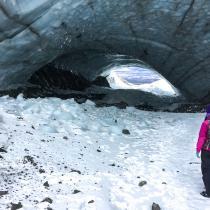 Definitely worth the hike and the wet feet :), looking forward to hiking again in the winter for the contrast. 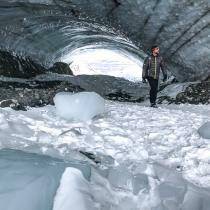 Has anyone been out to the ice caves? Would it still be worth it to head out there this weekend? April 14, 2018 - Stellar day! Departed “trailhead” at 10:30 am. Excellent conditions hiking to the Ice Caves (because we left early). 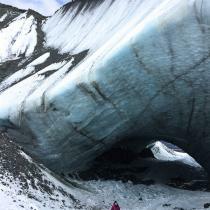 Enjoyed a lunch at the Ice Caves “restaurant” with excellent views of the Ruby Range. Debris had recently fallen at the entrance, but not on our heads! Departed the Ice Caves at 1 pm. Conditions became slushy and soft rather quickly we were glad for snowshoes! Saved us from postholing! Really nice hiking on Friday Mar 30. Yaktrax or similar would have been useful especially coming back down. 30 or so cars were parked on shoulder when we got there but trail wasn't really crowded. Hiked Easter Sunday. Beautifully clear but very strong winds. The trail was very icy so having a set of YakTrax would be useful especially for the trip down. We started the hike at 10:30. There were about 10 vehicles along the highway. By time we got down there were about 40. The trail never felt crowded The trip up is definitely worth the hike. Beautiful views the whole way up and down.